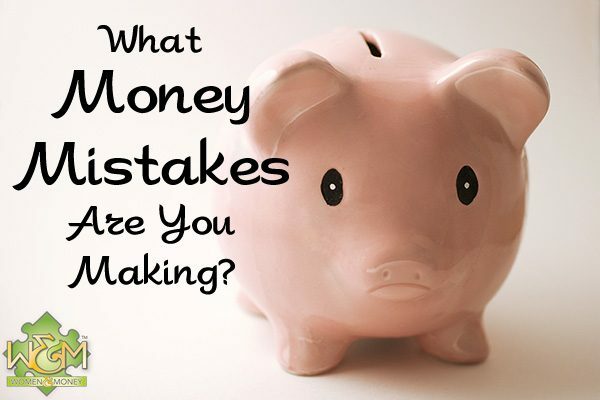 What Money Mistakes Are You Making? - Women and Money Inc.
What Money Mistakes Are You Making? I often speak with individuals who claim that they’ve made money mistakes in the past. “Why didn’t I just do __________!” they tell me, often very regretfully. While some people are quick to learn from their money blunders, others repeat them without realizing where they went wrong in the first place. As you probably know, mistakes are disguised lessons – so let’s learn from your past so that you can have a brighter future! This is a money mistake that everyone seems to have experience with. When you go into your bank or credit union, you are entering a business. Just like with any prosperous business, when you go through those doors you are going to meet salespeople who are going to try and sell you things. Because the bank doesn’t sell traditional goods, such as cars or cell phones, you might not realize what’s happening. The truth is that every time a teller or loans officer tries to offer you their product – a credit card limit increase, an overdraft, a tax free savings account – there are ‘strings attached’ in the form of interest or fees. The public implicitly trusts financial institutions to give them the most pertinent advice. Why? It might be because our generation was raised to trust authority or professionals, and in this case, financial institutions, without question. When we shift the focus away from seeing our banks as an educational resource and begin to view them as the businesses that they are, we might start to understand that our knowledge base needs to come from a more unbiased source. Remember, bank tellers, loan officers, even branch managers of financial institutions are not required to have formal education to do their jobs. This doesn’t make them ‘unqualified’ as such, but they have been trained with a specific purpose in mind – to sell you a product. When it comes to saving for your retirement, you may feel that you have time on your side. The truth is that it’s never too early to start your long term savings plan. I know that I sound like your mother right now, but truthfully, the younger you start, the less you have to put away to make a big impact. If you put away $100 a month when you’re 21, you’ll get into the habit of socking your money away. If you haven’t started saving and you’re in your 40s, then things might be a little more complicated. If you find yourself falling behind in terms of your retirement savings, contact an unbiased financial advisor so that you can get advice in terms of how you can get the most return for your money on a shorter time frame. If you’ve fallen behind with a retirement plan, coach your children or nieces and nephews about how to avoid your money mistakes. Pretend that you are a trapeze artist and you are going to make a huge leap to grab onto the bar. As you are in mid-air, you realize that there’s nothing below to protect you if you fall. Inevitably, if you practice the trapeze long enough, you will miss the bar and fall at some point, even if you are a professional. So really the question isn’t “if” you fall, but “when.” The same theory can be applied to your finances. Oftentimes financial ‘surprises’ catch us off guard and force us to rely on credit. But really, are financial surprises that common of an occurrence? If you’ve had a roof for over ten years, would you think of a roof leak as a surprise? How about when your car breaks down after 400, 000 kilometers? Chances are you probably can recall many instances when a financial surprise really wasn’t that surprising at all. So instead of feigning astonishment the next time your 4 year old laptop crashes, start your long term savings now, TODAY. Figure out an appropriate savings plan based on the items that have an expiry date (things that will inevitably need to be replaced) and actual unexpected costs (when your son falls and breaks his tooth). Even if you can only save $35 a month, it’s better to start somewhere! Many people seem to believe that if they keep their spouse in the dark about their finances, that their troubles will be put off for another day. And they’re right. Procrastination has long been a kind of strategic tactic used by one partner towards another, or arguably by both partners (“If my partner hasn’t said anything, everything must be okay.”) to keep their head in the sand for just a little while longer. But what is the true cost of ‘staying in the dark’ in respect to your finances? In my office I have witnessed many tearful confessions when one partner announces the financial mess that they and their spouse are in. The other party often looks shocked and dismayed, sometimes even accusatory – “How did you let this happen to us?” The truth is that if both parties are paying attention, then both partners will realize that something is just not quite right. I often see one partner relinquish complete control of the finances over to their spouse (“I just hand over my paycheque – I don’t know where it goes!”), and I can tell you this – if you want equality and financial transparency in your relationship, you will take an active interest in where your money is going. Staying in the dark is no longer an option. The next time you’re tempted to make a money mistake, especially if you’ve made it before, take a moment to reflect. Money mistakes aren’t usually the result of a one-time decision – instead it is the action or inaction that we take every day that results in money failures or successes!